"a Damocloid is any point-source object having a Tisserand Parameter with respect to Jupiter less than or equal to 2". By this definition, there were 41 Damocloids with decent orbits (orbital arcs greater than 30 days) as of 2011 February 09. By this definition, there were 53 Damocloids with decent orbits (orbital arcs greater than 30 days) as of 2013 July 31. Here is a list of the Damocloids with the orbit parameters. Damocloids are the inactive nuclei of Halley Family Comets. How Do We Know That Damocloids Are Not Just Weird Asteroids? What Do We Know About the Damocloids? 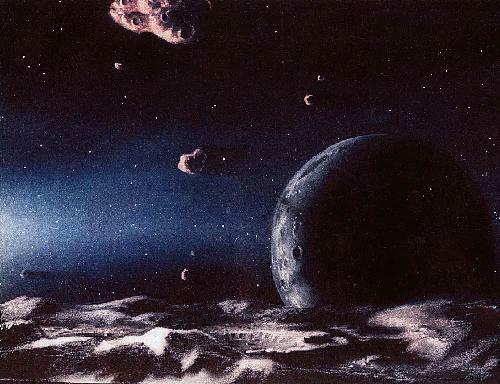 The albedos of four Damocloids have been measured and they are consistent in being amongst the lowest recorded for any Solar System objects (albedos are a few %). The Damocloids are extremely dark. The known examples are of modest size, with a median radius of 8 km. What Would We Like to Know About the Damocloids? How many of them are there? 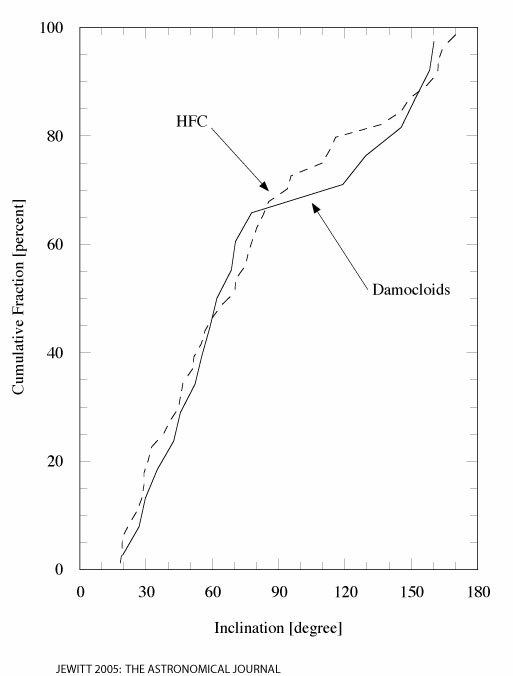 What is the ratio of the number of Damocloids to the number of HFCs? The answer to this question will tell us about the way in which HFCs die. In what ways do the Damocloids differ, physically or compositionally, from the Halley Family Comets? In order to be inactive, they must possess devolatilized ("mantled") surfaces. Are they different in other ways, perhaps as a result of repeated heating by the Sun when near perihelion? 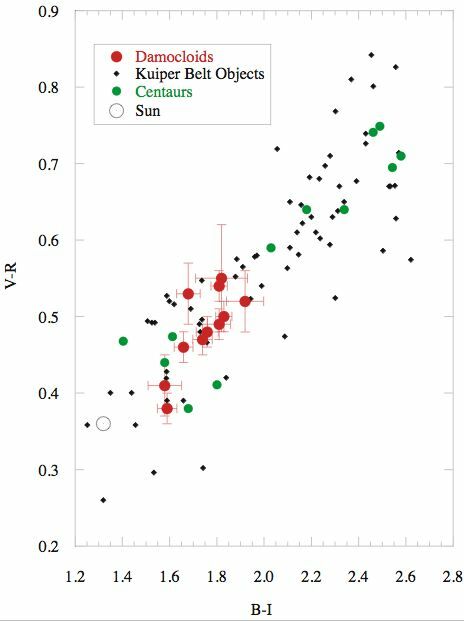 How do the physical and compositional natures of the Damocloids compare with the nuclei of Jupiter Family Comets? Modification of the JFCs is profound, including loss of the ultrared matter, but the Damocloid orbits are more extreme and these bodies appear generally less heated than the JFCs. Is there any measurable effect on their properties? Damocloid Paper (pdf file) Astronomical Journal, 129, 530-538 (2005).